QUIET AND COMFORTABLE: Standards redefined: revamped acoustics and fit make C4 PRO the quietest and most comfortable flip-up helmet that SCHUBERTH has ever built. Thanks to optimised neck padding and noise reduction around the mechanical attachments, the C4 PRO achieves approx. 85 dB(A) at 100 km/h on a naked motorcycle. FOR A COOL HEAD: THE INTERIOR: The Coolmax® lining is designed to ensure a secure and comfortable fit of the helmet. The fabrics are washable, anti-bacterial and quick-drying. The seamless head padding and integrated grooves for glasses make the helmet extremely comfortable to wear. Good air circulation thanks to multi-channel ventilation provides additional cooling for the helmet wearer. Of course the lining is certified in accordance with Öko-Tex 100, as well as removable and washable. THE VENTILATION ENSURES EVEN MORE AIR TO BREATHE: A complex multi-channel ventilation system inside the helmet shell ensures a pleasant flow of air. 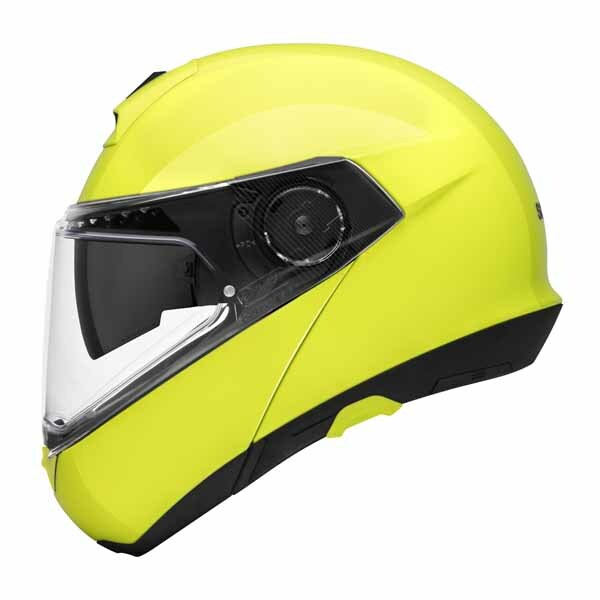 Inlets in the forehead and lower visor areas ensure a high level of air circulation and help keep your head cool. EXTRA-LARGE ANTI-FOG INSERT LENS: Preventing fogging has never been so simple thanks to the Pinlock® anti-fog insert lens. For a wide field of vision even in a sporty riding position. for optimal Bluetooth® and radio reception.